There are many things I have yet to share about myself with you all. I have a major story to tell.. I strive to be open and honest because really, I don’t see any other way to live. But once in a while, despite persistent jabs from my strong gut feelings to share some parts of my story I would rather keep hidden, I know that deep down, sharing my story and connecting with others is the right thing to do. Because in my past life’s troubles lies a lesson and a story that others may relate to, that they might be able to see themselves in and know that a tough time won’t last forever. It’s not normally a topic I bring up, but when I moved out of my parents home, I left without saying goodbye. We hadn’t always had a great relationship. We fought. A LOT. So much that at times, our conversations became unbearable. So unbearable that I just knew I had to leave. And the way I felt I needed to leave was without a goodbye or a note or anything. The way I left was without talking to my mom for months. I felt ashamed for many years for doing that to my parents because I knew I had hurt them. And badly, too. I was also really angry and overcome with grief for the way our relationship evolved, and not for the better, that I just decided to squash those feelings down and not talk about it. If you’re a feeling-squasher like me, you know this is not a good idea. It comes out in other ways. In other places you never thought they would come out. For me, this has come out in raising my own daughter. I will be honest and say that one of my anxieties THIS EARLY in life is that Narra will leave me the way I left my parents. And this scares me. Because even though I know that one day she will eventually leave when she is an adult, I don’t want her and I to ever fight the way my mom and I did and leave the house the way I did either. One of my vital behaviours as an accountability coach is to work out my mind everyday, as well as my body. Feed it with the proper fuel, just like I feed my body with nutritious food. It is called personal development. It is something I would’ve never done if I hadn’t become a coach. My personal development has taught me that in order to move on and move forward with my life and be free of my past, I need to un-squash my feelings. I need to destroy my anger. Surrender to my grief. Unpack all my feelings and celebrate how far I have come. I need to realize that my relationship with my own mom has come along way. That we made it through our bad times and that we can make it through more because we are family and despite what happens, I love her and she loves me. Nothing will change that. I need to realize that my relationship with Narra is a new one and that the past does NOT define the future. We have a new story to write. I have realized that my anxiety for future, is stealing my joy of the present. That it is preventing me from enjoying the little things that turn out to be the BIG things in life. Like this moment here. 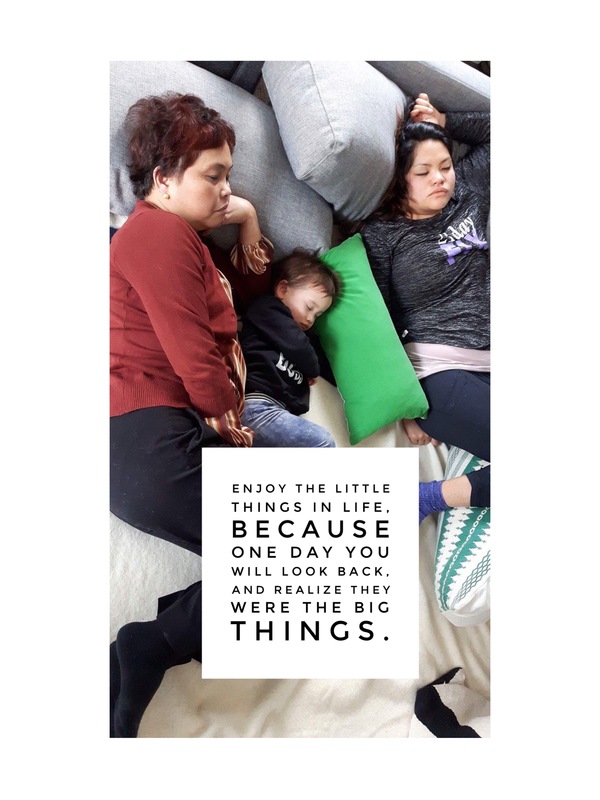 Three generations of women, passed out and on a sofa bed after a trip to Value Village.